We are now on Day three of our JeJu vacation. Happy Labor Day! We woke up again to amazing sunny beautiful weather. We cannot express enough how blessed we feel to be able to take in and enjoy the beauty of Asia. It’s 7:00am and it’s time to hit the hotel restaurant buffet, get completely packed, and check out of our hotel by 9:00am. Our group all piled back onto a tour bus and hit the road for another jam-packed day of places to see while on JeJu. The first stop was Oedolgae. Oedolgae is two giant stone pillars standing out at sea by themselves. The one standing upright is known as the grandmother and the pillar that is laying down is known as the grandfather. (Mrs. B could insert a snarky comment here but will refrain). Oedolgae is located at: Jeju Special Self-Governing Province Seogwipo-si Seohong-dong 791. What was most impressive about this rock pillar is the size! The pillar standing alone in the sea is 10 meters in circumference and about 20 meters in height. The location is also very popular among the Korean and Chinese because of a well known Korean TV drama using the location to film called Daejangguem. After Oedolgae we headed to Jeongbang Waterfall. This waterfall is the the only waterfall in Asia that falls directly into the ocean. The waterfall is 23 meters in height and is located at: Jeju Special Self-Governing Province Seogwipo-si Donghong-dong 278. Our guide Ms. Kim said that the reason the waterfall is so popular is because the wall of the water fall has an inscription written “Seobulgwacha”, referring to Seobul. Seobul was a servant of the Chinese Emperor Jin (BC 259~210) who was ordered by the Emperor to find the substance that would make him immortal. Seogwipo is also said to have gotten its name to mean Seobul headed back west. We enjoyed the waterfall and think that the rest of the group did too. Next we headed to Jusangjeolli Seashore at the Daepo Coast. HA-HA, yes another rock formation! No, really, this place was really neat! Many people believe that this place is manmade, but it’s not. The Jusangjeolli took formation when the lava from Mt.Hallasan flew to the sea of Jungmun. In the pictures you can see that the rock pillars are shaped like cubes or hexagons of various sizes. How cool is that? After looking at rock formations and craters all day… one tends to get hungry! Whew, luckily it is time for lunch. We ate at Hans Family Fusion Buffet Restaurant. Ms. Kim stated that this place was pretty popular among vacationers. Once again we enjoyed trying out new dishes and enjoyed this restaurant experience! We forgot to take down the address for the blog and thought we might be able to search it once we got home but out attempts were not successful. Sorry about that! After lunch we headed to Sanbangsan and Yongmeori Coast. We are now on the southwestern margin of the island and are going to see the gigantic lava dome that rises 395 meters above sea level. You will have to check out our pictures to get the full effect of what we got to see! After getting to see Sanbangsan our group went to O’Sulloc Tea House. Mrs. B was pretty excited! O’Sulloc is located at: Jeju Special Self-governing Province Seogwipo-si Andeok-myeon Seogwangseo-ri 1235-3. At O’Sulloc we got to learn about Korea’s traditional tea culture. The letter “o” in “o’sulloc”, means to appreciate and enjoy, and it also stands for the origin of sulloc, only sulloc, and of sulloc tea. The entire building is in the shape of a tea cup and is surrounded by lush green tea fields. Quite a sight! The following information was taken directly from the visit Korea website on O’Sulloc. Here, you can learn everything you’ve ever wanted to know about the culture surrounding green tea. Explore exciting topics such as: Korean tea culture, tea history, how tea came to Korea, tea gardens of the world, how to make tea, and how we use tea. Take a step back in time at the O’sulloc Tea Museum, learning the secret of the ancients, who used tea to increase longevity and ensure soundness of mind. A true art gallery, this place exhibits the works of ceramic masters. The display includes over 30 beautiful works of art, including pieces from artists Cheon Han Bong of Mungyeongyo and Kim Jeong Ok of Yeongnamyo. Cup styles range from chic and sophisticated to rough and earthy and reflect the artists’ varying interpretations of the simple tea cup theme. Long long ago, Koreans retreated into the great outdoors to enjoy a cup of tea with guests at Jeongja or Daecheongmaru, places that are as close to nature as you can get. There are no records specifying tea room sizes or outlining any rigid set of rules regarding tea drinking, but historical records imply that people preferred a more natural and free-spirited atmosphere while drinking tea. Everyone has their own favorite type of tea. Tea can be categorized depending on when it was picked, how long it’s been allowed to ferment, the shapes of the leaves, the species of plant, where it was grown, and so forth. The most scientific way to categorize tea is by fermentation period. The exhibition hall presents over 60 different types of teas including those from Korea, China and Japan. Here, visitors can appreciate a beautiful selection of tea cups from all over the world. The collection includes tea cups from over 100 countries and includes everything from traditional Chinese teacups to European demitasse cups. The cups are not only beautiful works of art, but also stand as a reminder of the exchange of ideas and culture (and of course tea) between the East and the West. After O’Sulloc Tea House we went to the Tropical Hallim Park. Hallim Park is known for its strongly scented exotic sentiments and famous Hyeopjae and Ssangyong caves. While we were visiting the park we had the strange feeling that we were back in our home state of Pennsylvania. We are not sure if it was all the green or at this point we were just delirious from all the crater/ rock pillar looking. All and all whatever it was, it was a nice familiar feeling. Hallim Park is located at: Jeju Special Self-Governing Province Jeju-si Hallim-eup Hyeopjaeri 2487. The park is known as one of the most popular tourist destinations on JeJu. The park was established on barren land in Hyeopjaeri, Hallimeup, and covered with tons of earth and began planting assorted subtropical plants in early 1971. This place is HUGE! Make sure you are wearing your comfy walking shoes while you visit the park. Hallim Park, almost 100 thousand square meters and has a variety of gardens. We especially loved checking out Palm Tree Road and the Bonsai Garden! The park also features a Water Garden, Subtropical Botanic Garden and much more! We were told the most famous tourist sites in Hallim Park are Hyeopjaegul and Ssangyonggul Caves known to be the only two-dimensional caves in the world. In addition, a folk village, children’s amusement park and outdoor resort facilities are very enjoyable for both children and adults. Hallim Park was the end of our scheduled itinerary. At this point we loaded up the bus with our group and went to the airport where we checked in and dropped off our luggage. We enjoyed our very first fast food meal at the Loteria. Loteria is Asia’s versions of McDonalds. Except this place was way better! I mean as better as any fast food joint can get. We ordered the European Frisco burger and the half shrimp burger half bulgalbi burger. Plus the french fries come with your pick of cheese or chili flavored seasoning! Exciting, right?! Actually, it was pretty good and did the job. Now….time to relax and wait for our flight to board at 7:55pm. See you all back in Dongducheon! Hope you got to enjoy what is left of your Labor Day weekend! JeJu Day Two Video FINALLY uploaded! We finally (thanks to Mr. B) were able to create and upload our video from our vacation to JeJu on day two. If you haven’t had the chance to read and check out the blog posting and pictures here is an easy link for you to check it out! What is everybody up to this weekend? The Bees are buzzing around Korea in various locations… check back with us soon! Not sure what Chuseok is? That’s okay we Bee’s were culturally unaware ourselves until we moved and were quickly immersed in South Korea. Isn’t that funny how culturally unaware we are as Americans? Typically we take on the attitude of well this is America and anyone moving here should immediately embrace everything American because that is just the way it is. Sad, but we all know it is very true. We are rude sometimes and believe that if you don’t speak fluent English there is something wrong with you. Living in a different country really opens your eyes and makes you step outside of your teeny tiny American bubble. We talk about this almost daily. We talk about how where we have come from in our small hometown people are so close minded and afraid of anything out of the norm. Culturally Asia really offers things to us that we would love to instill in our children one day. The importance of trust, acceptance, kindness, and just how important family really is. Unfortunately, if and when we do move back to the states we will also have to teach our children the importance of not being able to trust to much because people will take advantage of you, that you cannot always accept kindness as a real kind act like taking a piece of candy from a stranger, and that family can sometimes turn ugly and be ruled by a fickle jealous bone due to money. So back to our statement of what Chuseok is. Chuseok is known as one of the biggest holidays celebrated in Korea. Often Chuseok is known as the Korean Thanksgiving and get this, it last THREE DAYS! This year Chuseok falls on September 11th through the 13th. Yes, another thing the Korean’s know how to do! Chuseok is a time when Koreans travel back to their hometowns and celebrate together, share family stories, give thanks to their ancestors, and of course eat a delicious spread of food! Yes Chuseok is known as the Korean Thanksgiving but there isn’t a turkey or pumpkin pie like the Americanized version. Koreans celebrate this holiday with Songpyeon. Songpyeon is a half-moon shaped rice cake that are filled with various things like sweet bean, chestnuts, even sesame seeds. Something really treasured and valued is when the Korean families are together making these treats. I guess very similar to when Americans get together and prepare the turkey and such. You can totally forget trying to travel anywhere in Korea during this holiday! The roads are very chaotic…even more so! ha-ha! If you are trying to go somewhere, it is best to call in advance and make sure that the place is even open. Much of Korea is basically closed down on Chuseok (Including Mrs.B’s work). Well let it be said.. we warned you! During Chuseok families will visit the tombs of their ancestors. We have tombs right behind our apartment. We catch ourselves almost daily looking outside at the beauty of the green mountain side. Today and the next few days we will see Korean families on the mountainside removing weeds and trimming plans that may have grown around the site. korean’s also drink or offer food to their ancestors while they visit. We snapped a few pictures of our very own Italian version of Chuseok. Just kidding, we had a dinner with friends that have become our Korean family and celebrated each others company. What a great night! The weather in South Korea has been changing ever so quickly. Each morning and evening seems just a littler cooler then the day prior. We Bee’s are originally from Central Pennsylvania so we are used to experiencing four seasons. To us there is nothing like being able to go to sleep in the evening with crisp cool fall air creeping in through your bedroom windows. In all the places we have lived or traveled to, we both agree that Pennsylvania has some of the most breathtaking fall scenery. However, we are giving Korea a fair chance and will await to see when the leaves start to turn on the mountains what it has to offer up. With that being said, today we woke up to another cool September morning here in Dongducheon. We decided that we were going to take advantage of the weather and try to hike our way up and over Soyo mountain located only a few minutes away from our apartment. The weatherman was calling for showers but the sun was still peeking through the clouds and really didn’t look like it was going rain. We decided to take our chances and just go for it. What we both like about Soyosan is that you park and have to walk up a beautifully tree lined paved road until you reach the base on the mountain. A few posts back you can see where we messed around with the camera and snapped some pictures of us together on this road at night. Along the tree lined road runs a crystal clear stream. During the spring and summer months it is a very popular location for Korean’s to be picnicking and dipping their feet in the water to cool off. Today, as we mentioned is a bit cooler so there were not as many people spotted along the stream. Before you can continue walking to the very base of the mountain where you begin your hike you have to pay a 3,000 won admission fee. Unless that is, you have have a Dongducheon Korean license, then the admission is FREE! 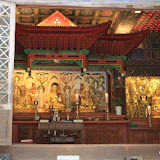 As you know from prior blog posts we have visited Soyosan numerous times. However, we have never actually hiked the whole trail.Typically we only go up to the Buddhist Jajaeam Temple snap some pictures and turn around. This time…we were ready! Looking back on the hike we determined that depending on your physical physique you can basically reach the top of the first peak within 30-45 minutes. Now we took our good old sweet time, snapped a ton of pictures, rested for about 45 minutes, and ate some snacks along the trail, so it took us roughly an hour and a half to reach the first peak. As we mentioned, we snapped tons of pictures and they are included within the post at the top. We also snapped pictures for various Korean couples along the way too! We met a sweet couple that insisted we try their Korean cake. Mr’s B enjoyed it but Mr. B was not a fan. We encountered many couples and each tried to share whatever they had with us including Makkoli the Korean-rice wine. Uhhhh yeahhhh we didn’t tell you that we were very bad and didn’t start the morning off right with a nice hearty breakfast… wine would have made that hike really interesting. After reaching the first peak we were pumped and moved fairly quickly to the next two peaks. Along the way in between each peak there are areas where you have to crawl over some rocks, use a rope to guide you along narrow stretches of trail, and go up or down a lot of stairs. Because of the time and our plans to host dinner for some friends we had to get a move on it and truck it back down the mountain, and unfortunately that meant missing the last peak. Again, looking back we should have just hiked the last peak because the path we took to get back down the mountain was insane! The path was totally washed out from all the rain and flooding South Korea experienced in July and the trail was full of rocks that just tumbled down the side of the mountain. We were part of the way down and there wasn’t a person in sight. Ms. B started to say what in the world were we thinking?! How did we get ourselves into the mess… It was a bit to late to turn back so we just had to commit to the rest of the hike down. It ended up taking us a little over a hour just to get down because of the unstableness of the rocks and lack of actual tail. At last we spotted some Korean hikers climbing their way up the path and we heard a family not to far behind us. Okay, we were not the only crazy people on this trail…Mrs. B’s feeling better. Well, that was until Mr. B said make sure you are watching for snakes! Snakes?! Ah! that’s not even a thought that crossed my mind as I was crawling down the rocks (Mr’s B.) Luckily, no snakes were spotted, the rocks didn’t crumble down and crush us, and we eventually made it. Mr. B would like to think this is all due to his advise of “three points of contact”. Mrs. B would like to think it is due to her uncanny direction capabilities ha ha! Nevertheless, WE MADE IT! In one piece… well, not quite, Mrs. B ended up falling due to sliding on the steep slick dirt and catching herself by putting all her weight on her arm and shoulder (she’s a bit sore). Mr. B’s knee gave out a few times on the rocks (needless to say he will definitely be feeling that in the morning). But again, WE MADE IT and that is all that matters! We understand if you are dreading the initial thought of a hike or might be unsure about trying it after reading over our post. In all seriousness we had a blast and we promises that the picturesque views overlooking the US Army base Camp Casey are worth the hike alone! Not to mention spotting multiple Korean war era bunkers (how cool is that!)! Cheers to all the baked ziti with sausage and caprese that we will consume tonight without feeling guilty! Day two of the trip we woke up to the most beautiful sunny day! The sun rays were beaming off the ocean waves, the clouds looked like gigantic marshmallows, we just knew the day was going to be amazing. We woke up at 7:00am, ate breakfast at the hotel restaurant buffet, and took a cab to Mini Mini Land. Mini Mini Land is located in Jeju Special Self-Governing Province Jeju-si Jocheon-eup Gyorae-ri San 56-4. So what is Mini Mini Land? 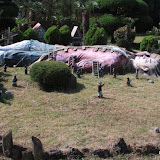 Mini Mini Land is a large park that features 116 famous miniature replications from around the world. To name a few, we got to see the miniature Bulguksa Temple, the Statue of Liberty, the Great Wall of China, the Forbidden City, the Leaning Tower of Pisa, etc. Each replication is constructed at 1/15 or 1/30 of the actual size. The Cost per adult person is 7,000 won. The hours to the park were displayed as follows: December to March 08:30 – 17:30, April to June 08:30 – 18:00 , July to August 08:30 – 19:30, September to November 08:30 – 18:00 (* Open hours of the park are subject to change depending on circumstances). After Mini Mini land we went back to the hotel and back up with our friends and decided to grab lunch together. Waiting for them at the entrance of the hotel we ran into some other friends that gave us the address of an Indian Food Restaurant near by. We were pretty excited about the sweet information they gave us and thought we would stick that in our back pocket in case we were in need of a place to go. It turned out that the couple we met up with for lunch were all about trying out the Indian Restaurant and we all decided to grab lunch there. The trip to the restaurant was interesting because the cab driver had no idea of where the place was. However unlike the Bee’s past experience of the cab driver trying to give the boot out of the cab because he was frustrated with not knowing the exact address this guy was pretty determined with finding the location for us to enjoy a meal at. After about 15 minutes or so and a few phone calls later the cab driver took an alley and sure enough there was the Indian Restaurant, Bagdad Café! We laughed and said we didn’t quite understand the cafe name connection to the Indian culture. The cafe’s kitchen is actually ran by a Nepalese chef, and was named after the film not the city, features cool rustic music and an outside terrace. Wow-We! we cannot express enough how delicious the food was at this place. We all shared each others dish so we had a chance to try everything out. Mr. B ordered a lamb curry, Mrs. B ordered a chicken tangri kabob stuffed with cheeses, cream, and indian spices (cooked over charcoal to perfection), and our friends ordered chicken curry, and chicken tandoori,of course we each had garlic naan. The café atmosphere was quaint and very comfortable. The waitress spoke English and Korean and was very attentive to our table. Hours after eating at Bagdad Café we were still talking about how great the food was! The café is located in the City Hall area of Jeju City. The address is Korean to give to your cab driver is: 바그다드 대한민국 제주특별자치도 제주시 이도2동. The address is english is: 1186-16 Ido 2-dong, JeJu City. The phone number is: 1188-16 064-757-8182‎. After lunch we were on our way to Love Land. We found this place in another bloggers blog so we decided to go there. This theme park is for ADULT’S ONLY (in our eyes and according to our standards). However once were at the park we couldn’t find anywhere that had ANY warning or restriction for minors. 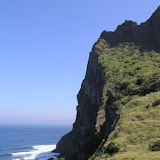 We have password protected this post titled JeJu (Day Two) Love Land Adults Only. The password to view this blog post is iam18orolder . By typing in this password You must be at least “18” years old to view. By typing in this password you are certifying that you are at least “18” years of age and Backpackbees is not responsible for any of the photo images you are about to view. Thank you for your understanding : ) The link to the Love Land post is Here. After a stroll through Love Land we headed to E-Mart to see what was there and made dinner plans with our friends to meet up at 7:30pm. We Bee’s wanted to see what JeJu had to offer on the streets and ended up in a huge underground shopping market (Jung-ang) located only minutes away from the hotel. The market was pretty cool and featured a ton of tiny shops offering all sorts of clothing, food, etc. At this point our legs were really tired and we still wanted to get cleaned up before going out to dinner so we went back to the hotel and got ready for our dinner date. We met up with our friends again at the hotel entrance and they picked the White House restaurant to go to for dinner. We were game! Eagerly looking forward to checking this place out after Ms. Kim provided an excellent review of the place. We caught a cab outside the hotel and the cab driver was pretty cool! This guy was originally from Seoul and spoke very good English. His appearance and style was very western and his hairstyle was like Elvis HA-HA! We had some good laughs with this guy! The best part was along the ride to the restaurant he called and made reservations for us and when dropping us off he ran in and asked for them to give us a discount. Talk about service! We pulled up to the White House Restaurant and were immediately taken back again by the beauty of the ocean. The sun was moments away from setting and the breeze coming off the ocean was just perfect. All we could think and say was, “Do we really have to leave this place tomorrow?” We walked up and down along the ocean and just took it all in before heading into the restaurant. Okay, back to the White House review. We were all really impressed yet again with this restaurant selection. The White House opened its doors back in November 2004. The intent behind this monstrosity of a place was that they wanted to sell a lot of kids of foods like a buffet, spaghetti, steak, and pizza. At the time there was no wood-fired pizza on the island so they decided why not!? The first thing you will notice when pulling up to the restaurant is that the place is HUGE! The interior and menus are intense but in a good way. There are different levels each catering to what you are in the mood for that day. An article we read about the place said it best, “There are two spectrums, with everything in between. All budgets and people are welcome. The bourgeois meet the proletariat. An abalone steak meets a paupers dinner roll. Expensive red wine meets a students Coke. Louis Vuitton meets Hello Kitty”…I think you get the point, right? We ended up on the third flood by accident. However the accident turned out to be a blessing because we found and smelled the 65-item buffet. The average price of the buffet is about 27,000 won. 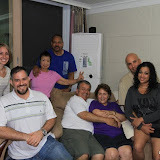 Once again we filled up on delish foods and ate until we were stuffed! The restaurant address is as follows: Yongduam 3 dong 2572-4. Telephone number is: 064-712-3200. We highly recommend the White House for dinner when you are vacationing on JeJu. Once we got back to the hotel our heads were ready to hit the pillow yet again after another adventurous day in JeJu. Day one of the trip started off fairly early. Our flight was scheduled to leave Gimpo airport located in Seoul at 9:55am. This meant to beat traffic we had to get on the road at 7:00am sharp. Surprisingly our group did just that and was on the road on time bound for Jeju! The best part about Jeju is how close it really is. The total flight time was only about 55 minutes. Very quick! We all laughed and said it was just enough time to get comfortable in your seat and then you were ready to land. We had a lot of kids on the plane and they were all troopers! We hardly heard a peep from any of them. Honestly looking back they all deserved a huge treat of some sort because during the trip they missed nap times, walked, were exposed to the hot sun, and had to eat Korea food. When we landed at the airport we were met by our guide Ms. Kim. We cannot praise this women enough! She was an absolute hands down fantastic tour guide! Plus she put up with all of us winy Americans. Ms. Kim is was born and raised in Jeju and speaks English incredibly well. We both agreed that if we find ourselves back in Jeju we will be giving Ms. Kim a call again. We didn’t go directly to the hotel to check in. We loaded up our luggage on a large tour bus and we sought out for our first destination point. Cameras in hand we were ready! First stop, Seongsan, also known as “Sunrise Peak”. Sunrise Peak is a plateau-like basin which is the crater of an extinct volcano. Eek! That’s right, we said volcano! Don’t worry it’s not active so we were safe. We didn’t get to see the sunrise here because of the flight times but we did get to see the panoramic views that this crater offered. This was after we hiked up a ton of stairs (just a warning). If you get to visit, take the time and hike it! You will not be sorry. After hiking the crater it was time for lunch. Our group had reservations at a Korean style bi bim bap restaurant. This place was outstanding! They were fully prepared for our large group and had our hot stone bi bim bap ready to go as soon as our bums hit the seats. After lunch we had a few moments before having to board the bus so we walked down an alley right outside of the hotel and got to see some scuba divers coming in from a dive trip. Mr. B’s heart skipped a beat and he was in awe watching them unpack with all of their gear. Of course for the next few moments he repeated that he couldn’t wait to get the rest of his PADI certification completed. It was now time to leave the restaurant and be on our way to the next stop on the itinerary. It was another crater known as the sangumbury Crater. The steps were not nearly as rough at this spot. I am sure you are asking why in the world are we going to see yet another crater? Well, the cool thing about the Sangumbury Crater is that it is the only extinct volcano on JeJu island located at ground level. It really is pretty crazy when you think about it. We were impressed by how green everything is on JeJu. The crater had lush forest growth and animals inhibiting it. We were told by our guide that the crater is being studied for that very reason. Interesting, huh? After we were done at Sangumbury Crater our next stop was the JeJu Folk Village. The village exhibits a comprehensive collection of traditional folk articles from the island ranging around the year of 1890. We met a couple on the trip that were from Panama and he tearfully said that the JeJu Folk village really reminded him of growing up in Panama. It blew our minds getting to look at the village houses and cultural items. By now the sun was scorching us all so luckily there was a snack stand along the trail that served ice-cream. Most of the group bought ice-cream and the other half bought a cool drink. We were all starting to drag so the cool treat was a definite pick-me-up. Ms. Kim finagled a deal that allowed our group to take the tram the rest of the way through the village and back to the bus. Whew! Not a single soul had an issue with that. We loaded up the bus and the next stop was to transfer to the hotel and check in. We arrived at the Ocean Suites hotel at about 5:30pm. The staff treated the group very well and had the check-in process set up so that we were all able to get to our rooms quickly. We L-O-V-E-D the hotel room! Everything about the hotel was new and fresh. The decor was very modern and sleek, and the view was of the ocean and an outdoor performing arena. Ahhhhh…we didn’t ever want to leave. Our tour group package included breakfast every day at the hotel restaurant. The restaurant featured a large buffet of both western and korean dishes. We would highly recommend the hotel to anyone planning on taking a trip to JeJu. The hotel location is: #1-1260 Samdo-2Dong, JeJu-City, Telephone: 064-720-6000, and website www.oceansuites.kr . After a long day of fun filled events we took showers and got ready to find some place to grab dinner at. We ended up linking up with a couple and had a blast! We ate at a Korean style restaurant that served Samgyeopsal. We have mentioned having this sort of a meal in past blog postings. Anyways the thick slices of pork with the sides really hit the spot! We were stuffed when we left and all agreed it was an excellent choice. After dinner we headed back to the hotel but along the way we heard music and singing coming from the outdoor performing arena that we could see from our room. Of course we had to go check what was going on out. The performance was a song that described a story. The only thing we really could take away from it was that it was about fishermen with large casting nets. With bellies full and eyelids heavy we all decided we were going to head back to the hotel and get some rest. Day two of the trip is a free day with lunch and dinner on your own. Wow does time fly when you are having fun! The Bees have arrived in Jeju-do and are excited to begin our island adventure! Day one down and Jeju is AMAZING! We were able to see two volcanic craters that are sitting HIGH in the mountains and right on the oceans edge. We were also able to visit the Korean folk village. After a lon day we arrived at our hotel and it is beautiful, 5 stars 2 rooms overlooking the city and ocean! After all that we ate some delicious samgibsa and tons of sides. We promise to upload pics as soon as we get back. Cant wait for mini mini land and Love World tomorrow.